Marist women's basketball (16-7, 8-3 MAAC) was triumphant once again as they defeated Siena (9-12, 5-5 MAAC) 73-58. LOUDONVILLE – Marist women’s basketball (16-7, 8-3 MAAC) was triumphant once again as they defeated Siena (9-12, 5-5 MAAC) 73-58. The Saints took the lead early in the first quarter, but the Red Foxes regained control for the entirety of the game from there, going on a 14-1 run in the second quarter to build a double-digit lead. Siena found a rhythm early to pull ahead 18-12 midway through the first as they shot nearly 60% from the field. Marist held the Saints without scoring for the final three minutes of quarter to lead at the break, 19-18. Siena started off the second with a pair of buckets, but Marist went on an 8-0 run to lead 28-23 halfway through the quarter. The Red Foxes did not give up a free throw until the 4:59 mark of the second quarter. Marist’s run ballooned to 14-1, and Siena did not score a field goal until 3:30 left in the second. Marist outscored Siena 21-13 in the second quarter to lead 40-31 at halftime. The Red Foxes had shot 54% from the field and 50% from three in the first half. The Red Foxes started the third quarter strong, outrebounding Siena 9-4 for a 14-7 shot advantage and a 52-40 lead. Marist scored well in the fourth quarter, but Aaliyah Jones singlehandedly kept the Saints from falling farther behind with clutch three-point shooting. Despite an impressive 27-point performance from Jones, Marist outscored Siena 15-11 in the fourth and emerged victorious. 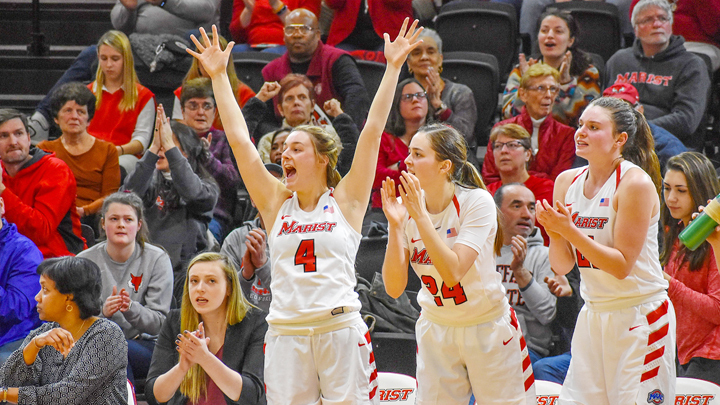 Marist women’s basketball will be heading to Manhattan on Feb. 7.